Home Healthy Living	A Revolutionary Way to Help Stop Bladder Leaks! A Revolutionary Way to Help Stop Bladder Leaks! 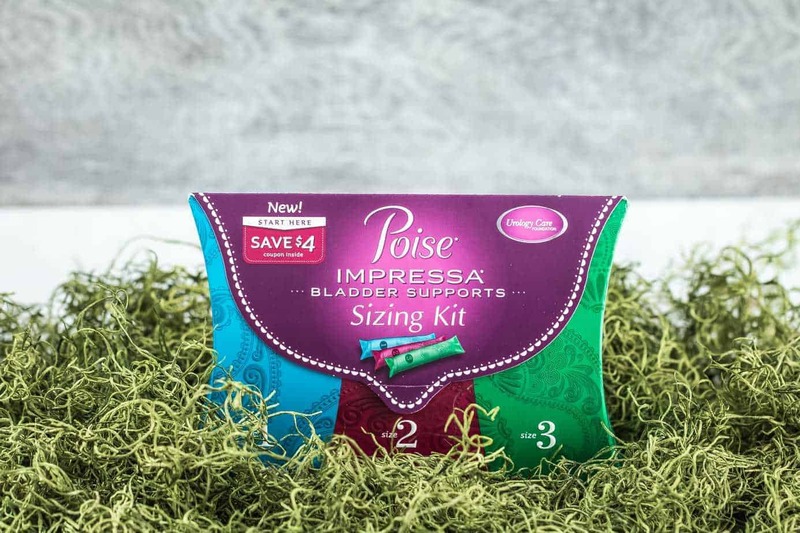 Many thanks to Poise for sponsoring today’s story and encouraging me to try the new Poise* Impressa* Bladder Supports! The hardest I have ever laughed has been when my kids say and do funny things, oftentimes with them not even knowing they’re being hilarious. My daughter was in the supermarket a month or two back and needed help out to my car with my groceries as I was picking up some firewood and couldn’t carry it all myself. A nice man came over to help us and my daughter started giving her commentary on the situation which was in the earshot of many people as it was the busiest part of the day. She is two and just starting to talk, and was saying things like “He nice man! He happy, not sad, so nice and help! He have muscles and push push!” She kept this up for a good 60 seconds and quite a few people had stopped what they were doing to listen to her go on. The man who was helping us was great about the whole situation and was blushing a little bit and laughing it up. I myself was laughing the hardest I’m sure. I was proud of my daughter for putting the sentences together as that was kind of a new thing for her at the time, and the things she was saying just got me going where I couldn’t stop laughing. Laughter is the cure for so much, and being able to really laugh without having a care in the world is an unparalleled feeling. For me that had been tough to do on more occasions than I care to remember. With SUI (stress urinary incontinence) it can really make a lady self-conscious, where your laugh, cough, or sneeze are all things that you want to hold back on to prevent an embarrassing leak. It can get in the way of fully exercising, and prevent a woman from feeling confident and free. Those are some pretty important things in my life. SUI is very common, too; in-fact 35 million women experience it. 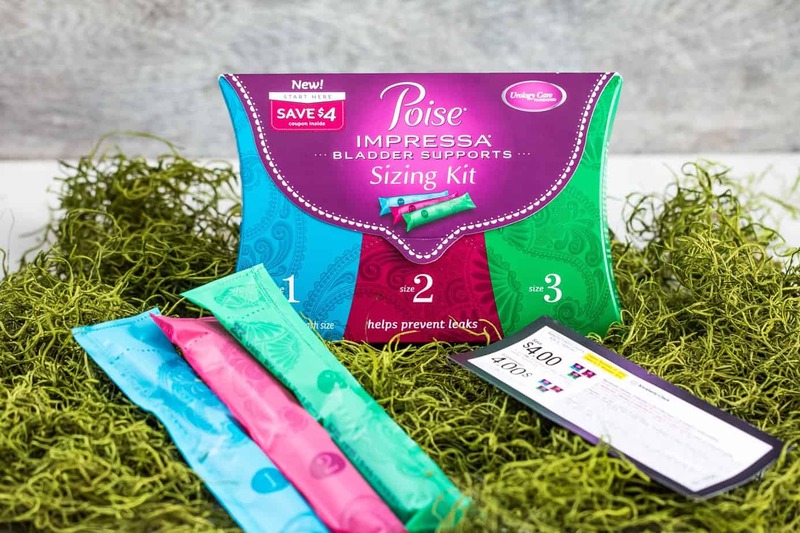 Poise* Impressa will stop leaks before they even occur. Impressa comes in three different sizes, and the Sizing Kit helps you find your most effective and comfortable internal fit. Each kit includes six bladder supports (two of each size), along with a $4 coupon toward a 10-count Single-Size Pack of Impressa. It’s a great product, something that’s easy to put on and forget about for the rest of the day. Feminine and free. Why hasn’t Poise Impressa* been around for ages? There sure is a need for it and it is a product that just makes sense. I love that there are products like these for those who don’t want medicine to try and fix it. Those sizing kits are so helpful if you’re new to using them. They’re great for active women! Poise makes great products for all women and this one is no exception! I just tried these, too! Great for post=pregnancy runners! If you’ve ever had a baby and live an active lifestyle, Impressa is wonderful! It was about time someone created something for women like this. Kudos to Poise! It’s great to know that there are now many options for those who are suffering from light bladder leakage. This sounds more convenient than pads. It sure does! Glad there is something to help, too! It must be hard to deal with. I never try this product and it looks like a great product and it haves a beautiful review. I would try this. I’ve seen this around a couple of times and I’m very curious! It looks like a reliable pad for bladder leaks. This actually makes sense-it pushes the bladder back up where it is supposed to be. I really have to try these. I love they have a sizing kit! I don’t suffer from Bladder Leakage but it’s so great that there are products like this for those who do. That’s a great idea. It makes a lot of sense, too. I love that they’re trying out new ways to control LBL. I don’t have it yet, but as a mom, I know it’s only a matter of time. After having my child I have suffered from this. Drives me nuts, I can’t run or jump without that reminder. This might be just what I need. This is a real solution to a real problem – glad that more is being offered to women. I keep seeing these advertised. It sounds like a great idea for any mother or woman that has this problem. Good to know it’s out there. Luckily, bladder leakage isn’t something I have had to deal with. I have hear amazing things about this product! An important topic that lots of people don’t want to talk about! I’ll probably need these after my second baby! Sounds like a great product! These are very helpful for those who have bladder issues, just lucky I’m not one of them. My mom suffers from SUI. She does Kegel exercises, but accidents still happen. I will share this with her. I know, I have a friend whose needed it, I would like to share this for her. This is a great and brand that I know. I think SUI is somethong that I am experiencing. It really is an uncomfortable feeling . I love how these are sized so you can find the perfect one. After three kids, this is sometimes my problem, too. Sounds like a great product with plenty of options to suit everyones needs. It’s nice to have options. Looks like a good product for those that need the comfort and security of knowing that they do not have to worry about their problem. I love that there are different options. This is something I think everyone who has had children can use, especially as they get older! This is a product that is changing peoples lives. I will have to share this with my Mom friends. I think the sizing kit is a great idea. They’re really doing a lot to make great products, and get the word out. I like that. I dont have leaking issues. Thank God for that but I know women who do and they say it can be really frustrating. I have heard a lot about these lately. I haven’t tried them yet though. Even though I have never personally experienced this, I know that it’s something that many women experience. Thankfully, there are options such as this. The sizing kit is neat. This would be useful for bladder leakage. It’s nice to know that there are solutions out there for people who experience this problem. It’s always good to have options, as that usually leads to confidence! I’ve used these and I have to say they are totally unique. I love the idea of STOPPING the leakage rather than cleaning it up.